Calgary Has a New Building Maintenance Bylaw. Now What? So Bylaw 33M2016 happened and you’re one of the owners responsible for the 584 buildings in Calgary now required to undergo a visual review every five years. The new Building Maintenance Bylaw, just passed by council in June, is an effort to protect Calgarians from the hazards of falling debris from buildings. The bylaw will address hazards on Calgary’s oldest buildings in a phased approach, but any building over five stories tall will need to have a visual assessment of its building envelope completed at some point to comply with the new bylaw. A visual assessment sounds simple enough, but who’s going to do it? And more importantly, who’s going to take on the responsibility (and liability) of signing off on the building envelope being ‘safe’? What if you come across something that looks a little unsafe; how are you going to fix it and who’s providing the expertise to ensure it’s addressed on a priority basis? Completing the assessment on time is important. Not only do you want to avoid negative publicity that could follow an incident of something detaching from your building envelope or collapsing, but we all have a moral obligation to protect building occupants and the public. Public safety was ultimately the goal of the bylaw after all. Not having the assessment ready when it’s requested can also result in fines up to $2,500. Failure to keep the building free of hazardous conditions could result in fines up to $5,000. Given the possibility of multiple offences, those fines could add up. 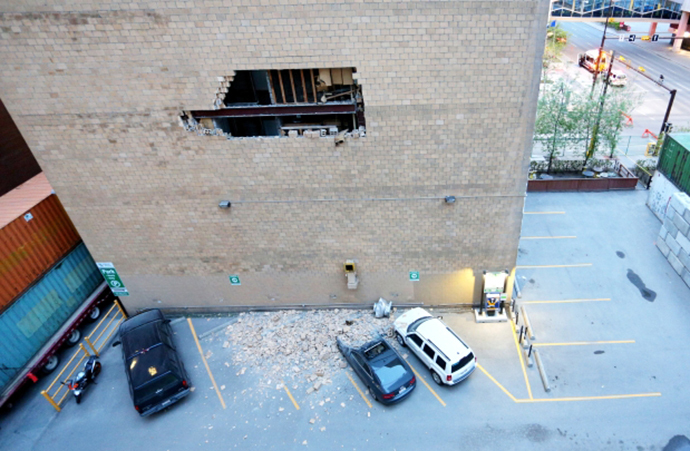 Image: Vehicles were damaged by bricks falling off the wall of a building at 6th Avenue and 7th Street SW in 2014. Depending on the age of the building, an assessment may not need to be completed right away. Older buildings, 45 years and greater in age, are up first with assessments needing to be completed by January 1, 2018. Buildings in subsequent age ranges will need to be reviewed in a phased approach. This way, The City can focus on the highest risk buildings first. 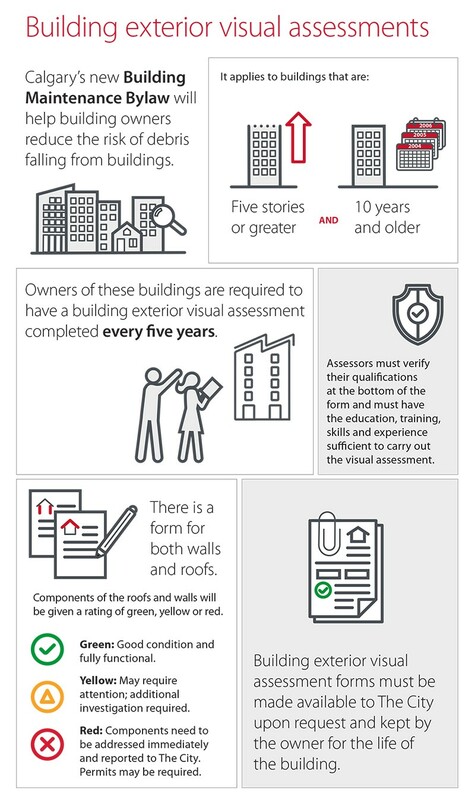 Nevertheless, it’s important to note that visual assessments must be completed for new buildings by the tenth anniversary of the building’s occupancy permit. Subsequent assessments will need to be completed every five years after that. So what will that assessment entail? The bylaw simply requires a visual review of the building. The review might be completed from the ground, but the reviewer may need to use a swing stage if the height and complexity of the building demands it. According to the bylaw, the visual review needs to be completed by someone “with sufficient education, training, skill and experience relating to [building envelope] such that the person’s visual assessment may reasonably be relied upon”. The assessment doesn’t need to be completed by a professional. However, it’s important that the reviewer is aware of the importance of carrying out the assessment with diligence and the inherent liability that comes with completing an assessment. The visual review will provide building owners with a report and a green/yellow/red indication system of potential hazards. Building owners will need to hang on to the reports for the life of the building, even passing them off to future owners. The report should identify any elements that are not securely attached, thereby causing a danger to people or property if it were to detach or collapse. The report will help you determine whether hazards require immediate attention. You may need to work with a consultant to address the hazards and find the underlying cause of the problem, which may not be immediately obvious to the untrained eye. If there are any hazards, building owners will need to report them to The City and follow up to ensure they’re addressed adequately. The cost of the visual review is going to vary depending on factors like the size, age, and complexity of the building. Some consultants may take the assessment further by doing an interview with building operations and reviewing past reports on any work that was completed. There are also ways to find more value in the assessment process. If the assessment is for an office tower, for example, you could combine it with a periodic review of the sealant to leverage the expertise of your consultant. For a condominium, you could try pairing it with a Reserve Fund Study. As such, it’s important to set the parameters of the review with your consultant in advance. It’s also good to know that the assessment allows BOMA members to work towards compliance for the Building Envelope Safety Supplement by BOMA Calgary and Work Safe Alberta. More information is available from The City of Calgary here. This post is intended as supplementary information to the bylaw only. Please review the official bylaw to understand how it may affect you and the buildings you own or manage. The bylaw can be found here.